Add some sparkle to your event! These cupcake toppers look great on cupcakes, cakes, sandwiches and more! Set of 6 or 12 toppers. Scroll through images for colour chart. Made of 250gsm premium non-shed glitter cardstock. Glitter on front side, white on reverse side. Attached to food-safe standard wooden toothpicks. Toppers measure 4.5cm x 2cm / approx 1.8 x 0.8 inches each (not including toothpicks). All products are individually made with care and attention, not mass produced nor factory made. Your gift will be made to order, packed and shipped from our studio in sunny Singapore. Arrives presentable, ready to gift in 100% biodegradable, earth-friendly packaging. We deliver to you or your recipient's doorstep, wherever it is, by DHL. Only $4.99 flat per order, worldwide. Ask away! 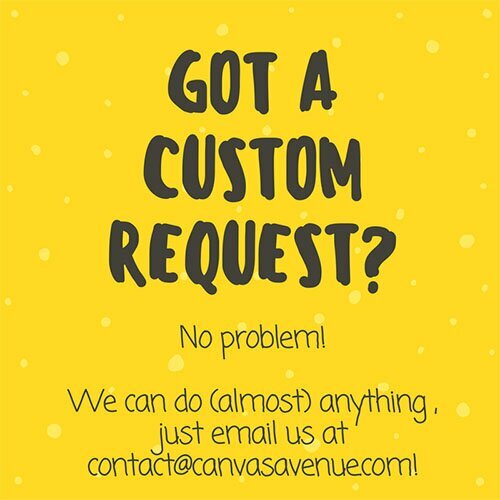 Live chat with us by clicking the green button on the bottom right of the screen, email us at contact@canvasavenue.com or read our FAQ. Every product is made to order just for you. Please kindly allow us around 2-3 days to process and pack your order. Enjoy worldwide shipping (with tracking) via DHL, at a low, flat rate of $4.99. Affordable, simple, and fuss-free. Shipping time is not inclusive of our order processing time of 2-3 days (time taken to make and pack your order). Note: 95% of orders reach within the above times. However, due to random custom checks or during festive periods, delays may occur. Please understand that these shipping times are estimates and we cannot guarantee delivery by a certain date. When you are happy, so are we. Rated with 4.85/5 based on 251 reviews. I got these earrings for my hiker sister for Christmas. She absolutely loves them! They are adorable and very adventurous looking. Would recommend. Very nice quality, thank you! Bag looks amazing! Bought as gifts, good quality and very quick delivery. Thank you! Stay in touch and get our latest designs, promotions & events delivered right to your inbox! © CanvasAvenue.com. All Rights Reserved.